The Isle of Skye is one of the Hebridean Islands group. Also known as “The Misty Isle” or "Eilean a Cheois" in Gaelic, Skye is rich in history, geology and simply some of the finest scenery in the world. Portree is the anglicised version of the Gaelic "Port Righ" or “Kings Port” and [One of the youngest residents to live near Kerrysdale B&B] marks the occasion of a visit by King James VI. Wentworth Street in town, is home to most of the shops, pubs and restaurants that cater for all tastes and budgets. During the summer months, some of the hotels lay on free traditional musical entertainment. On this page we have included some information about the Isle of Skye and the attractions here. Simply click on the links to find out more. This is situated on the outskirts of town with its shops, restaurant, Sea Eagle exhibition and small theatre and cinema. At the end of the town is the harbour where you can book boat trips to see the huge variety of marine & bird life boat trips to see the huge variety of marine & bird life that thrives around the island. During the summer months, organised buses start from the town square to tour parts of the island. Bus tours can be booked from the Tourist Office in the village. Coral beach, one of only two beaches on Skye. 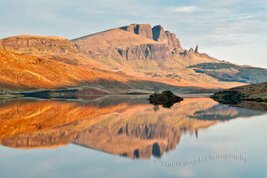 If walking and great scenery are your interests, you should visit the Old Man of Storr and the Quiraing – famed for its rocky pinnacles and strange rock formations, or a stop at the Kilt Rock Falls.ering cliffs and light house at Neist Point the most westerly edge of the island. A visit to the Walk Highlands website is always worth looking at beforehand in order to find the best walks most suited to your interest and ability. No visit to the island is complete without a visit to the Talisker Distillery on the shores of Loch Harport, which was built in the mid 1800’s and is the islands only single malt distillery.